Why do they keep killing off the main characters? 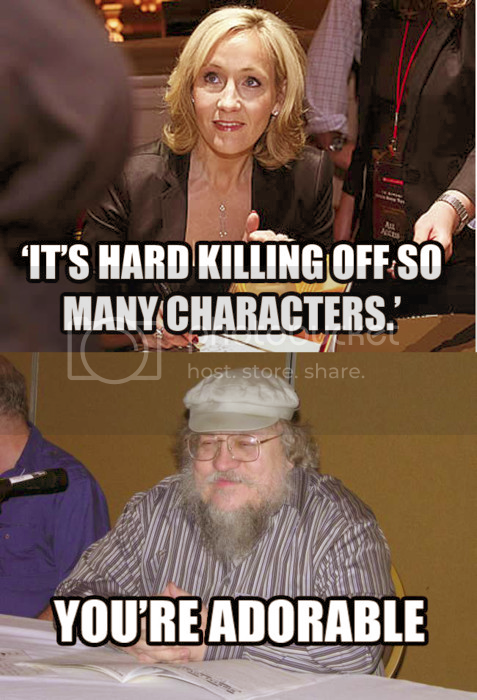 Ask the author, George R. R. Martin. Nathan Fillion once tweeted that the next book was taking too long. George R. R. Martin tweeted back that every time someone asks when the next book will be ready a Stark dies. J.K. Rowling (Harry Potter) and George R.R. Martin (Game of Thrones). Edited to fix image URL. I'm only on the second book now. Right about where they are in the series. I love that they do this. It makes the story seem more real, if that is possible in a fantasy world. Wait, Foxy, you aren't The red Woman are you? 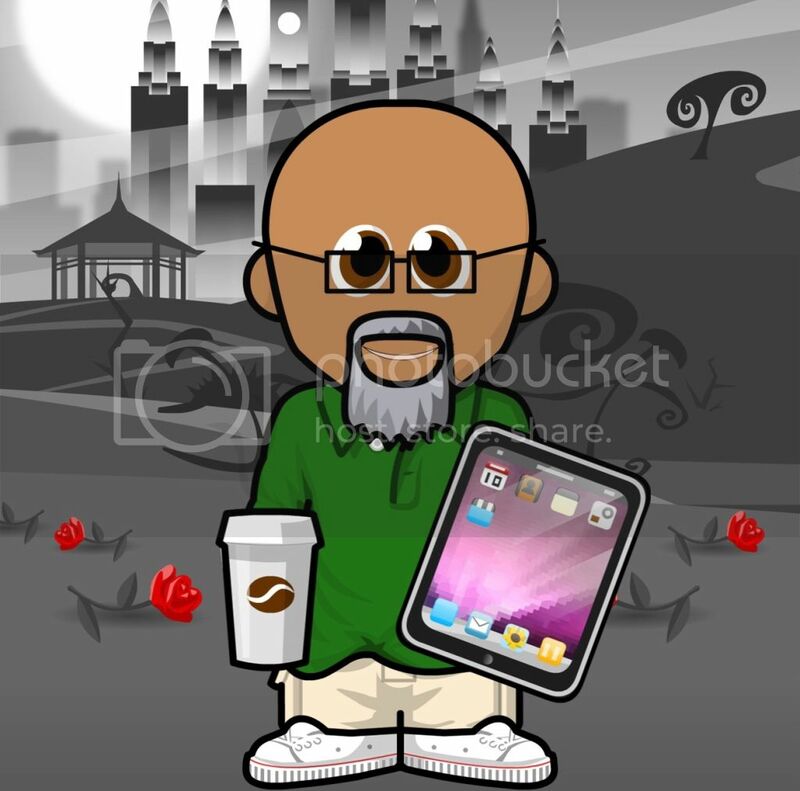 LOL, the ONE time I link directly to a pic rather than uploading to my Photobucket! Yes, I was going to mention that I have never seen a pic that is not on your own site of Photobucket. That will teach you. That birthing scene was something else. So messed up. I really like the merchant in Quarth that is trying to make the deal with the Mother of Dragons. I think they found a great actor to play him. I'm not finding fault with the casting choices so far. Then again, I have not read the books so I have no basis for complaints. I'm really loving Peter Dinklage's performances. The Red Lady is ... interesting. I'm not sure I could hear someone tell me, "The night is dark and full of terrors." without thinking of her and shuddering a bit. Yeah, so far the actors are pretty darn close to the book. But, call me crazy, Tyrion's character is supposed to be a really ugly dwarf...and I find Peter Dinklage cute. He by, far, is the best character on the show and if he gets killed off (which I will eventually find out as Im reading the books), I will more than likely lose interest in the show. He really is fantastic and really deserved that Golden Globe! They've made subtle changes from the book, but they haven't strayed too far. The kid they have playing Joffrey is actually very good as well. Pure evil that one. I hope Sansa gets him! I was shocked about Ned Stark's character. I only started reading the books after the first season and was unprepared for that. I love Sean Bean. That birth - creepppy... The books are really good. But ugh! a ton of characters to remember. Yeah, so far the actors are pretty darn close to the book. But, call me crazy, Tyrion's character is supposed to be a really ugly dwarf...and I find Peter Dinklage cute. The books are really good. But ugh! a ton of characters to remember. Yeah. I'm having a better time watching the 1st season on Bluray where I can have the little thing pop up and tell me more about the characters as they are introduced and die. I have to say that Martin is as bad at introducing a ton of tertiary characters as David Weber is in his Honorverse Space Opera. When a book as a chapter at the end devoted to telling you who each character is, you know there will be a problem keeping the characters straight. But, then...we haven't seen the Freys yet. Don't forget we saw the Freys back in the first season, when Cat negotiated with them to let Robb's army cross at the Twins. You're absolutely right; I did forget. Good catch!